The Uploads section of the library lists all files that have been uploaded into Xcalibur W for deployment to managed devices. Files are automatically categorized according to their file extension. 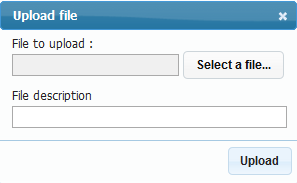 Before a file can be uploaded to devices through a task command, the file must be uploaded to Xcalibur W. To upload a file, simply click on the icon on the status bar and then navigate to the target file.